PORT SIZE : ¼" thru 1" (6mm – 25mm) for globe and angle form, screwed end. ½" thru 2" (15mm – 50mm) for globe and angle form, flanged end. 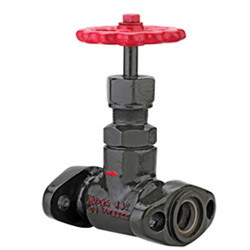 SUPERFREEZE SEV Series precision calibrated adjustable seat nut flow regulating valves (expansion valves) are ideal for metering or flashing expansion of liquid refrigerant. These slotted seat nut are more tolerant to dirt particle than tapered plug expansion. Hand wheels are of red color to distinguish them from shut-off valves. Liquid feed or circulating liquid over feed evaporators. High pressure or intermediate pressure liquid feed to accumulators, intercoolers or recirculators.